Robert Meigh T. Dolor or Buboy is a grade 1 student at Hopewell Integrated, Bacoor Cavite. He likes surfing the net and playing the piano but dislikes ants, clay and being kissed – sorry ladies. Buboy. 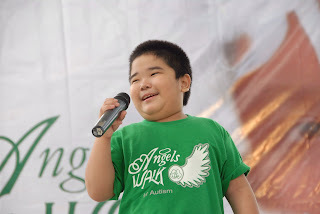 Only 8 years old, Buboy proved his singing prowess bagging the 2 amateur singing competitions at the Cavite Chapters Mini-Olympics last July 23 and Freshmind Montessori School Singing Contest last August 4.